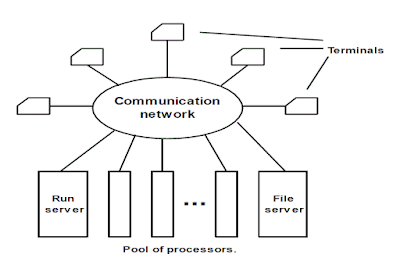 A distributed system is a model in which components located on networked computers communicate and coordinate their actions by passing messages to each other. · The minicomputer model is a simple extension of the centralized time-sharing system. 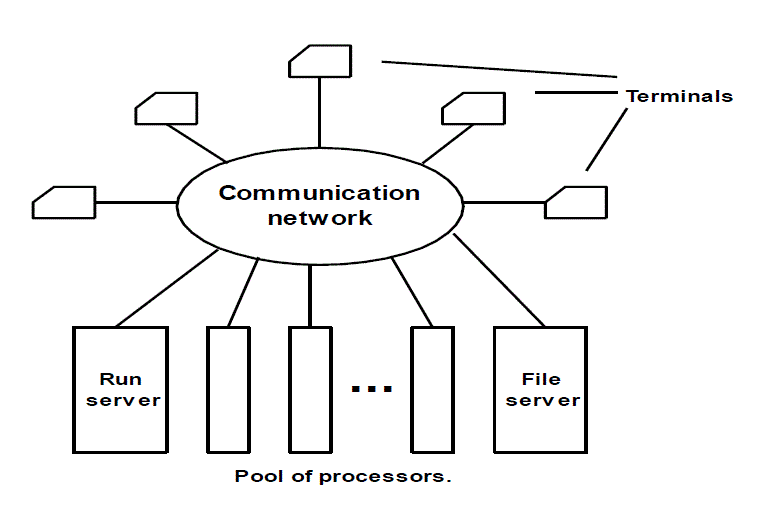 · A distributed computing system based on this model consists of a few minicomputers (they may be large supercomputers as well) interconnected by a communication network. · Each minicomputer usually has multiple users simultaneously logged on to it. For this, several interactive terminals are connected to each minicomputer. Each user is logged on to one specific minicomputer, with remote access to other minicomputers. · The network allows a user to access remote resources that are available on some machine other than the one on to which the user is currently logged. 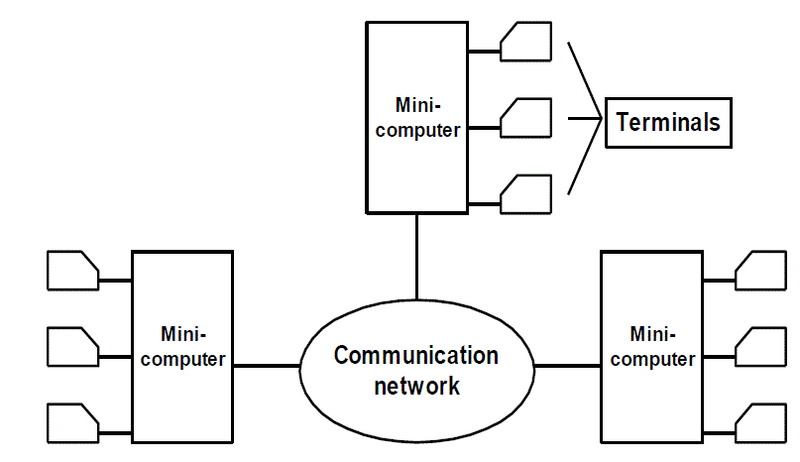 · The minicomputer model may be used when resource sharing (such as sharing of information databases of different types, with each type of database located on a different machine) with remote users is desired. 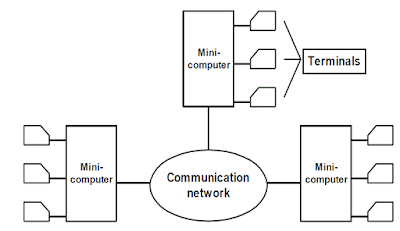 · The early ARPAnet is an example of a distributed computing system based on the minicomputer model. 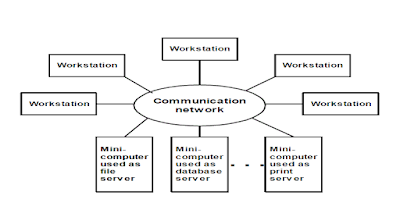 · A distributed computing system based on the workstation model consists of several workstations interconnected by a communication network. · An organization may have several workstations located throughout a building or campus, each workstation equipped with its own disk and serving as a single-user computer. · It has been often found that in such an environment, at any one time a significant proportion of the workstations are idle (not being used), resulting in the waste of large amounts of CPU time. 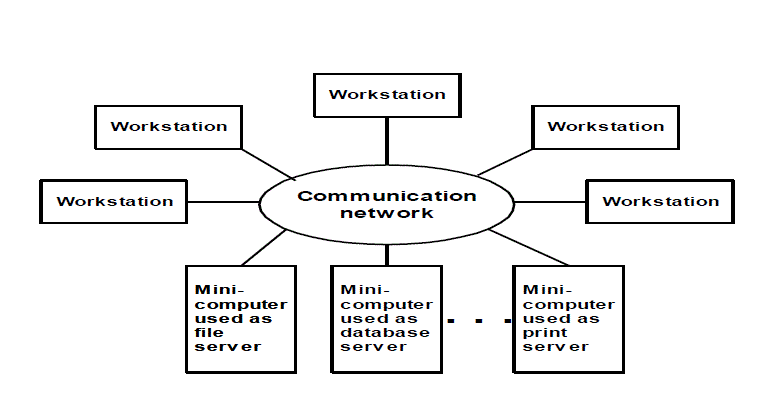 Therefore, the idea of the workstation model is to interconnect all these workstations by a high-speed LAN so that idle workstations may be used to process jobs of users who are logged onto other workstations and do not have sufficient processing power at their own workstations to get their jobs processed efficiently. How to find idle workstation? i. It allows the remote process share the resources with home process. How to transfer the process from one workstation to another for execution. i. In this method,remote process is killed. ii.Drawback: All processing done for the remote process gets lost and the file system may be in an inconsistent state. · The workstation model is a network of personal workstations, each with its own disk and a local file system. · A workstation with its own local disk is usually called a diskful workstation and a workstation without a local disk is called a diskless workstation. · With the proliferation of high-speed networks, diskless workstations have become more popular in network environments than diskful workstations, making the workstation-server model more popular than the workstation model for building distributed computing systems. · A distributed computing system based on the workstation-server model consists of a few minicomputers and several workstations (most of which are diskless, but a few of which may be diskful) interconnected by a communication network. · Note that when diskless workstations are used on a network, the file system to be used by these workstations must be implemented either by a diskful workstation or by a minicomputer equipped with a disk for file storage. · One or more of the minicomputers are used for implementing the file system. · Other minicomputers may be used for providing other types of services, such as database service and print service. Therefore, each minicomputer is used as a server machine to provide one or more types of services. Therefore in the workstation-server model, in addition to the workstations, there are specialized machines (may be specialized workstations) for running server processes (called servers) for managing and providing access to shared resources. · For a number of reasons, such as higher reliability and better scalability, multiple servers are often used for managing the resources of a particular type in a distributed computing system. · For example, there may be multiple file servers, each running on a separate minicomputer and cooperating via the network, for managing the files of all the users in the system. Due to this reason, a distinction is often made between the services that are provided to clients and the servers that provide them. That is, a service is an abstract entity that is provided by one or more servers. For example, one or more file servers may be used in a distributed computing system to provide file service to the users. · In this model, a user logs onto a workstation called his or her home workstation. Normal computation activities required by the user's processes are performed at the user's home workstation, but requests for services provided by special servers (such as a file server or a database server) are sent to a server providing that type of service that performs the user's requested activity and returns the result of request processing to the user's workstation. Therefore, in this model, the user's processes need not migrated to the server machines for getting the work done by those machines. 1. It is much cheaper to use a few minicomputers. 2. Diskless workstations are also preferred. 3. Users have flexibility to use any workstation. 4. It does not need a process migration facility. 5. It is suitable for high performance interactive application. 6. A user has guaranteed response time because workstations are not used for executing remote processes. Example of distributed computing systems based on the workstation-server model: V-system. · The processor-pool model is based on the observation that most of the time a user does not need any computing power but once in a while the user may need a very large amount of computing power for a short time (e.g., when recompiling a program consisting of a large number of files after changing a basic shared declaration). Therefore, unlike the workstation-server model in which a processor is allocated to each user, in the processor-pool model the processors are pooled together to be shared by the users as needed. · The pool of processors consists of a large number of microcomputers and minicomputers attached to the network. · Each processor in the pool has its own memory to load and run a system program or an application program of the distributed computing system . · A special server (run server) manages and allocates the processors in the pool to different users on a demand basis. · When the computation is completed, the processors are returned to the pool. · Processor pool model is not used concept of home machine. User is logged to the system as the whole. · This model allows better utilization of the available processing power of a distributed computing system. · It also provide greater flexibility than the workstation model. · Processor pool model is not suitable for higher performance interactive applications. · Examples of distributed Computing Systems based on the processor-pool model : Amoeba and Cambridge distributed computing systems. 1. A user logs on to the system as a whole. 2. It allows better utilization of available processing power. 3. It provides greater flexibility than the workstation-server model. 1. It is unsuitable for high-performance interactive applications. · Out of the four models described above, the workstation-server model, is the most widely used model for building distributed computing systems. This is because a large number of computer users only perform simple interactive tasks such as editing jobs, sending electronic mails, and executing small programs. The workstation-server model is ideal for such simple usage. However, in a working environment that has groups of users who often perform jobs needing massive computation, the processor-pool model is more attractive and suitable.